WASHINGTON - In honor of Native American Heritage Month, celebrated every November, the Peace Corps recognizes the rich history and contributions of American Indians and Alaska Natives. Many volunteers with native heritage, past and present, have committed themselves to national service through their work in the Peace Corps. 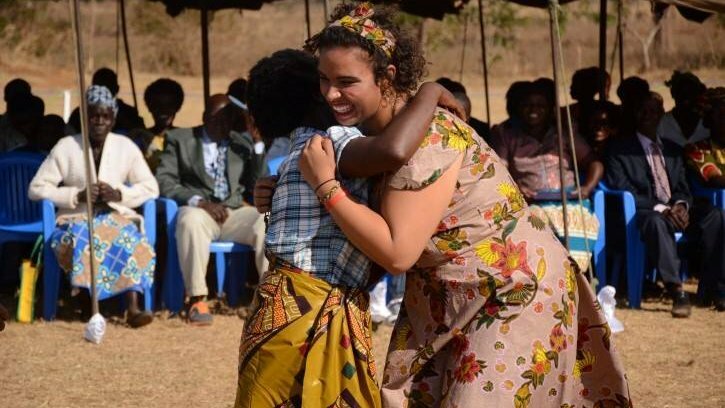 Madiera embraces her host mother, who was instrumental in teaching her one of Malawi's many languages. After finishing her volunteer service, Madiera plans to continue supporting the Peace Corps’ goal of building cross-cultural bridges. She has plans to learn more of the mother tongue of her Ramapo Lenape ancestors, an endangered Algonquin dialect called Musee. The Virginia Tech alum actively shares her own culture with her Malawian community, and is excited to share Malawian culture with her family back in the United States. Read more of Madiera's story here. The Peace Corps is committed to sharing the diversity of the United States with communities across the globe. The agency has 69 volunteers with Native American or Native Alaskan heritage currently serving in communities around the world.